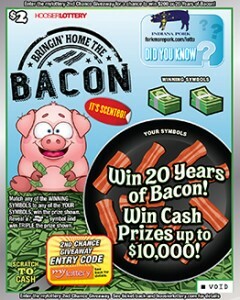 Home › Uncategorized › Indiana’s Bringin’ Home the Bacon Lottery Tickets turning Heads, and Noses! Indiana’s Bringin’ Home the Bacon Lottery Tickets turning Heads, and Noses! Bacon, bacon, bacon – who can ever get enough bacon? No one! And now the Indiana State Lottery is capitalizing on the world’s love of the aromatic stuff by presenting the new, never-before-seen, Bacon Lottery! The Hoosier Lottery debuted its new savory-scented ticket sales on Tuesday. You can find the new $2 tickets – appropriately titled ‘Bringin’ Home the Bacon’, at over 4,400 lottery outlets statewide. Let’s face it; 99.99% of the global population has an inexorable fascination with this insanely delicious pork product. Considering how popular it is, I’m half surprised it took someone this long to come up with a plan to launch bacon-themed lottery tickets. But I’m sure glad they did. Now I just have to drive to Indiana… or maybe even move there. Smells Like Bacon – 20 Years Worth! Even if there wasn’t a chance to win the ultimate bacon-lovers prize, the simple fact that bacon lottery tickets incorporate the age-old scratch-n-sniff technology, so that every scratch comes with a whiff of fresh cooked bacon ,is probably enough to make people buy them. But there’s a much bigger prize that 5 tremendously lucky people will get their hands on. The top prize on Indiana’s bacon lottery tickets is – are you sitting down? – 20 years’ worth of free bacon! That’s right. You could be enjoying that most savory of all meats for the next 20 years, delivered in regular installments valued at $250 per year; $5,000 in all. Perhaps there is a better prize on the menu, although it’s hard to say anything is better than bacon. The top cash prize on Bringin’ Home the Bacon is $10,000. And you could buy a lot of bacon with that, too. The overall chance of winning any prize on the new bacon lottery tickets is 1 in 4.29. Lottery officials in the Hoosier State teamed up with Indiana Pork to come up with this mouth-watering new concept. Indiana Pork is a non-profit organization that represent over 3,000 hog farmers in the state. Through the new partnership, Indiana Pork and the Hoosier Lottery will be hosting several events throughout the area. Bacon tastings will be held in June and July in Evansville, Fort Wayne and Indianapolis, where bacon-themed prizes will be given away. To help promote the new bacon lottery ticket, the Hoosier Lottery has set up a special webpage dedicated to bacon. Visitors can take the Bacon Quiz to test their knowledge of the aromatic meat, get new bacon recipes, stare longingly (try not to drool) at the BaconCam and much more. Non-winning Bringin’ Home the Bacon lottery tickets are eligible for the Hoosier Lottery’s “Second Chance” promotion. Participants must have a valid mylottery account, which can be registered for free at HoosierLottery.com. To submit a non-winning ticket for a second chance prize, the player must log into their account and access the Second Chance promotional area. Second Chance tickets may only be submitted via the online lottery website. Mailed/Faxed submissions will not be accepted.